Consequently, it is becoming imperative for companies to keep talented workers. The 2018 Workforce Retention Report concluded that 28.6% of employees left a job that year and that number will rise to 33% by 2020. The cost of replacing each of these people is estimated at about 20% of their annual income. 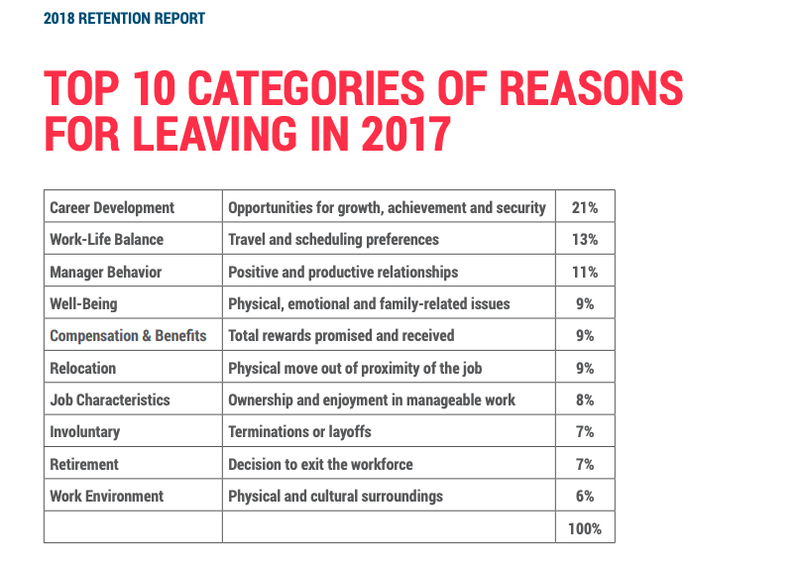 Looking at the chart above, I realized at least 68% of these reasons could have been avoided. Workers of all ages state that achieving a balance between their career and personal life is essential. Younger people are most concerned with learning new skills and moving up in their careers. All employees want to know their presence matters. Of course, some companies may think you can’t treat your employees well and be profitable yet the opposite is true. For twenty years, Fortune magazine has been surveying millions of employees to determine what makes A Great Place to Work. Publicly traded companies on this list have delivered two to three times greater returns than stock market indices. These forward-thinking companies are more resourceful, innovative, agile, and reflect better customer service, among other traits. Last year the same survey changed one measurement term to determine how companies work to ‘maximize human potential’ for all. The organizations that scored the highest using this new term grew their revenue about 10 percent faster than the companies which rated highest using the old method. Human-centered is not just a tagline at Heath Software, and it does not refer only to our products or our relationships with clients. First, I need to care about the people I work with. Great work is not done by unhappy people. Additionally, we all want to work with a purpose: A mission that’s supported by the actions of the company and a lack of hypocrisy in the leaders. It takes effort to develop a human-centered workplace and a broad view to support the well-being of all. With this in mind, we should consider practical things such as a comfortable, healthy workplace and a flexible schedule when needed. We need a workplace where we can be authentic with each other. As the leader, I need to know how my team is doing, and they need to be able to talk to me if they’re going through a rough patch. People sense if the leader cares. It’s more than playing games together or having pizza and beer night. When something significant is going on with my team, I want to know about it. It’s vital we all commit to the same goal and invest in what we are doing. I want to build a company in which employees know they can participate, collaborate and be recognized for their excellent work. Unquestionably, these things make for a better workplace. What surprises me is that so few companies are implementing these sound practices. Gallup analytics reveal that only 15% of worldwide workers came to work today engaged and ready to maximize their performance. And yet, some of the world’s best organizations have an engaged workforce of 70%. What’s the difference? These workplaces have good leaders who have created a culture of engagement where employees can develop and thrive. These companies also look for managers who have a talent for leadership and train them to be even better. Employees are people first and need genuine relationships which the best managers understand. Leaders must clearly communicate the values of the organization and make learning and development a priority. If we want to keep the talent needed to do great work, we need to think just as much about our people as our product. I believe a human-centered workplace is just as good for business as it is for humanity, and it is the right thing to do. We face critical challenges in the years and decades ahead, and the only way we will rise to the task is to recognize and acknowledge the best in ourselves and in each other.